To kick off Black History Month, students and leaders from Alabama’s historically black colleges and universities (HBCUs) gathered at Lawson State Community College in Birmingham to discuss opportunities and challenges and ways to strengthen the state’s workforce. U.S. Sen. Doug Jones moderated a panel discussing “Alabama at Work: Strengthening the State’s Workforce,” that included Lawson State Community College President Perry Ward, Marc Bayard of the Washington, D.C.-based Institute for Policy Studies, Birmingham Mayor Randall Woodfin and Bishop State Community College President Reginald Sykes. 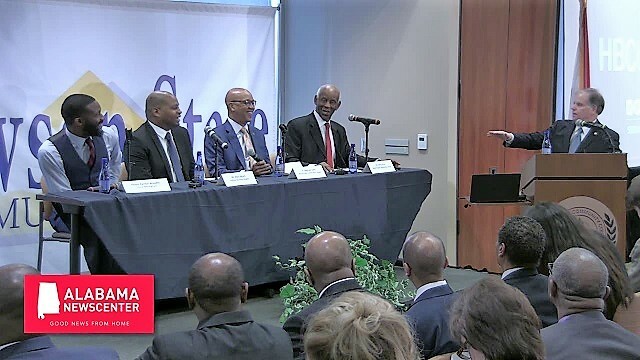 The panel discussed how HBCUs can partner with other schools and businesses across the state to provide the necessary training and education to students to make them successful and effective in the workforce. Combining efforts from high schools, community colleges, two- and four-year universities, and businesses can help students secure well-paying jobs. Woodfin highlighted the importance of collaboration and breaking down silos so knowledge and information are shared and interests align. Panelists also discussed the importance of apprenticeships and creating alternatives to the traditional three avenues for students after high school (college, military, workforce). The Alabama Workforce Council has set a goal of adding 500,000 high-skilled employees to Alabama’s workforce by 2025. The panel argued that creating opportunities for apprenticeships and putting a stronger emphasis on continuing adult education can complement current avenues into the workforce to reach this goal. A second Jones-moderated panel focused on opportunities and challenges for HBCUs and how they can compete in the 21st century. Thurgood Marshall College Fund CEO Harry Williams, UNCF CEO Michael Lomax, Miles CollegePresident George French, Alabama State University President Quinton Ross and J.F. Drake State Community College President Patricia Sims. The panelists agreed funding levels from the government and private organizations provide a challenge for HBCUs. Funding and endowments from the state and federal government have historically been lower for HBCUs than other institutions, they said. A lack of funding can affect graduation rates and maintenance of facilities. Sims stressed the importance of educating students and their families on the funding options that are available. Diverse revenue sources provide greater opportunities to support students and their development, the panel said. Despite the challenges that HBCUs face, the panel highlighted the opportunities and successes of many HBCUs. The presidents of Alabama State, Miles College and Drake State emphasized that HBCUs have talented student bodies and that businesses and industries are hungry for that talent. Many HBCUs partner with four-year institutions and businesses in the area, like the auto and aerospace industries. Others provide courses and training in high-demand careers, like military intelligence. As part of the summit, Jones offered an all-day job fair for current HBCU students. Companies and organizations with ties to Alabama were on-site to show off the state’s workforce opportunities. Representatives from BBVA Compass, Boeing, Airbus, Shipt, Regions, Alabama Power, Honda, Toyota, Southern Research, branches of the U.S. military and more participated in the job fair.